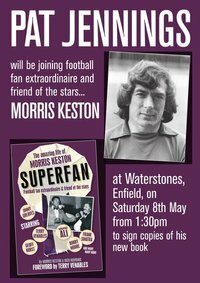 Pat Jennings played for Stoke City – courtesy of Morris Keston! I read with interest on the Spurs website last night about the clean sheet record which came under threat until our visit to Liverpool. It was set in the 1970/71 season and ended by an Alan Hinton penalty in the 83rd minute at White Hart Lane it suggested. Cue reference to the Spurs “A Complete Record” book to see if that was the first game – or one of the first games – I saw at White Hart Lane. It turns out it was not; that was the next season when he scored another, courtesy of a clumsy challenge from Mike England, late penalty to seal a 0-1 win for Cloughie’s men. I remember the referee lecturing Terry Hennessy for stealing extra yards at every throw in all afternoon. Sounds familiar – well to Phil Brown and Hull or Tony Pulis and Stoke anyway! What was different were the A-Z boards around the ground which helped inform us speccies what was going on elsewhere in the First Division and the men selling “peanuts, peanuts get your roasted peanuts” or chocolate and delivered it by throwing it with the money going the other way. Tell that to the youngsters today and they won’t believe ya! The defence setting the record Kinnear, Knowles, England and Beal. Who else? Big Pat was in goal for most of the games but Ken Hancock mande one of his rare appearances during the run. Despite the disappointing result against Wolves on Saturday I did enjoy the day as I was upmarket in the Danny Blanchflower suite against the normal Block 53 position. What was enjoyable was the introduction of a number of ex players Martin Peters, Cliff Jones who is such a lovely man, Alan Mullery, Pat Jennings, Phil Beal, John Pratt, Paul Allen, Ralph Coates and Martin Chivers. 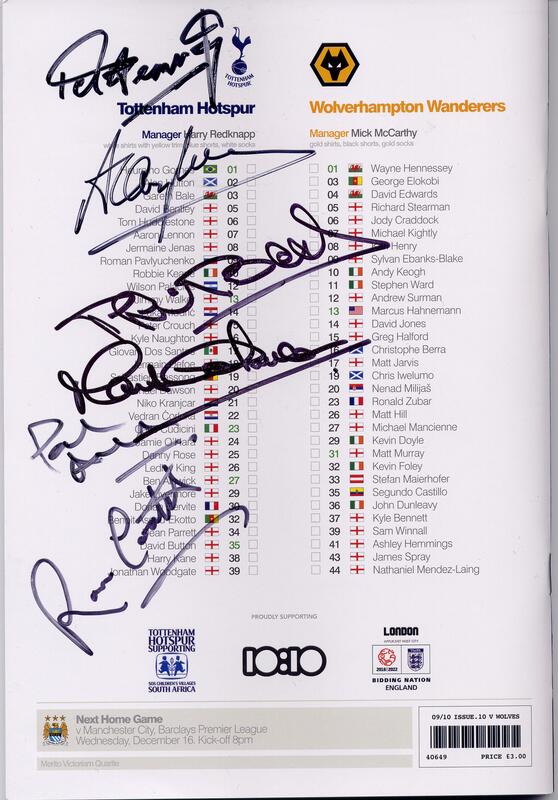 Having spied a sharpie in big Pat’s hand I managed to get some autographs which are on the back of the programme displayed. I did have a chat with Mr Chivers and he was interested that Mr Gilzean had attended the Scottish Hall of Fame dinner. My guest and I also met up and had an enjoyable chat with some Norwegians who had popped over for a game – they had hoped for Man City but due to the day change from Tuesday to Wednesday had settled for Wolves instead and shared a table with a Dad and Lad from Swansea – a first visit to the Lane for the Dad a fan of 38 years. I should have known when he told me that disappointment might be the order of the day!